It is not certain in which year this photograph was taken, but it looks like the 1950s or 1960s. The photographer was standing on Station Road, looking towards Quorn Cross, with the White Horse on the left and the Royal Oak on the diagonally opposite corner. 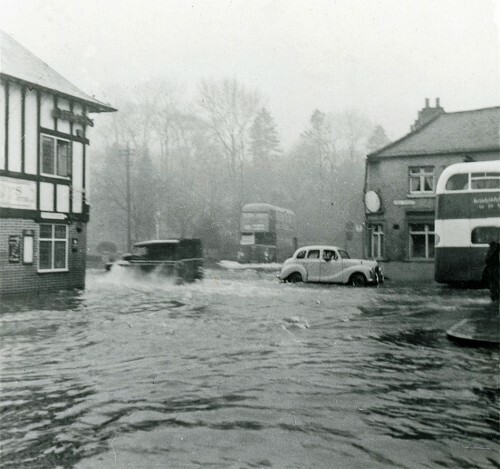 Due to flood prevention measures, flooding on this scale is far less likely today. This photograph was kindly lent to Quorn Village On-line Museum for scanning, by Barry, who was landlord of the White Horse pub from the early 1980s.